Webster University student Tre'Shawn Griffin is in the midst of a two-week "takeover" of the StudyInholland Instagram account by Nuffic, the organization for internationalizing education in the Netherlands. An American student studying international relations at Webster's Leiden campus, Griffin is posting snapshots and thoughts about student life, living in the Netherlands, Leiden and Webster University. 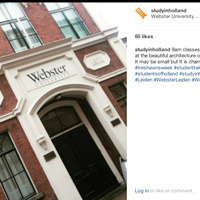 Follow along on Instagram @studyinholland. For other snapshots of Webster student life on Instagram, check out @mywebsteru, which is taken over by a different Webster student from campuses throughout the global network each week.